But when it comes to painting as a sideline--a part-time job, if you will--it appears to be the domain of musicians, with collectors seeking the works of a select few, including Ronnie Wood, Grace Slick and Anthony Benedetto. Ronnie Wood and Grace Slick are rock 'n' roll icons. Wood, who played bass guitar for the Jeff Beck Group and was later a founding member of the Faces with Rod Stewart, has been with the Rolling Stones for nearly 30 years. Slick was the colorful, outspoken lead singer for Jefferson Airplane, which took flight at the height of the psychedelic era in the 1960s during the Vietnam War. Slick remained with the group on and off during its incarnations as Jefferson Starship--then, in the 1980s, when it was known as simply Starship. Michele Rosen knows how well works sell by Slick and Wood. A 20-year veteran of the gallery business, Rosen now owns Gallery 319 in Santa Monica, CA, which as of September had handled Wood's art for eight months and Stick's for four. Rosen's clients and passersby are well heeled--albeit often in sandals--as the beach is just blocks away. Gallery 319 had a show of Ronnie Wood's newest works Aug. 28, but his technique--vibrant and eye-catching in its own right--sells itself. "When I am in the process Slick writes, "As far as I can determine at this point, creation is constantly taking place and my life is a result of in pursuit of that process." She continues, "Sometimes the form is music; sometimes it is giving birth, or maybe just sitting and appreciating sunset. Simply watching beauty helps it 'exist.' of painting, I am gone to a place that relieves me of trivia and encourages the expression of a more vibrant existence. Painting is a still form. Unlike film, the movement has to be implied on canvas and translated to you by way of a mutual and basic recognition." 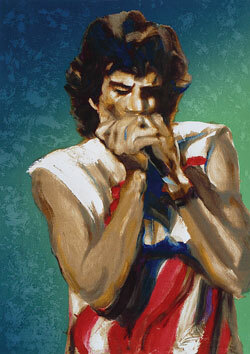 Ronnie Wood is a bit more matter of fact: "Painting is a good outlet for me. With a band I'm part of a unit, whereas with my art, I control the whole thing," he says at www.limelightagency.com. Ronnie Wood sketches or paints whenever he can, his subjects often are his bandmates: singer Mick Jagger, guitarist Keith Richards and drummer Charlie Watts. His output includes portraits of notables such as jazz vocalist Billie Holiday and the Doors' Jim Morrison. He also portrays animal species whose survival is not guaranteed. Among his cityscapes is a dark, gothic rendering of Prague, Czech Republic. Grace Slick is also an accomplished portrait artist, having done several of her friend Jerry Garcia (Grateful Dead). A favorite among collectors is Slick's portrayal of Janis Joplin ... as a wood nymph.